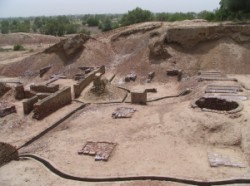 Mohenjo-daro and Harappa were the largest cities of the Indus Valley Civilization among all (over 100) towns and villages which have been discovered so far. It remains unknown whether Mohenjo-daro and Harappa were two large cities of a single empire or capitals of two states, while some scholars suggest that Harappa succeeded Mohenjo-daro which has been devastated by floods several times. The plans of both cities reveal highly advanced ancient civilization, while the sewerage and drainage systems throughout the Indus Valley Civilization were the most advanced sanitation systems in the world at that time. The city of Mohenjo-daro was divided into two parts - the Citadel and the Lower City. Fortified citadel located on an artificial hill on the western flank encompasses large residential structure, massive granary and two large assembly halls which implies on existence of central government or administration. A lot of attention attracted the elaborate pool measuring 12 meters x 7 meters ( 39 feet x 23 feet) with a depth of 2,5 meters (8 feet) which probably served as a public bath or some sort of tank but it might have been used for religious and spiritual ceremonies and rituals. The residential buildings in the Lower City build from sun dried or baked mud bricks were open only to the inner courtyards, while the stone stairs imply that many houses were at least two stories high. Many houses had small bathrooms and were well-provided with drains which lined the major streets. 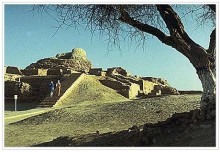 The ruins of Harappa reveal similar plan to Mohenjo-daro - a fortified citadel on a hill on the western flank and living quarters on the eastern flank of the city. The remains of sun dried or baked mud bricks imply on a monotonous architectural style. Buildings perhaps included elaborated wood carvings or decoration with other materials but there is any preserved evidence. Insight into Indus Valley Civilization arts and culture provide only various sculptures, pottery, jewelry, and terra-cotta, gold and stone figurines. Especially important are numerous small seals predominantly made of steatite which depict variety of animals such as oxen, crocodiles, elephants, tigers, rhinoceros, etc, while depictions of humans are very rare. Every seal usually included inscriptions in the Indus Valley Civilization script which has not been fully deciphered yet although the language of Indus Valley Civilization has been identified as Dravidian.